In Maryland, law enforcement officers can simply follow you around and analyze any DNA you discard. They don’t need your permission. They can have it when you get a drivers license. They can have it at a toll booth. They can have it when you touch that. Or that. Or that. 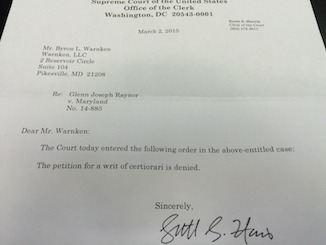 The Court of Appeals got Raynor v. State wrong. They were concerned with how similar DNA harvesting was to your face on a camera. (It’s not, that’s volitional. Shy of a bio-hazard suit, DNA is discarded non-volitionally.) They were concerned with crime scenes. (They shouldn’t have been. DNA comes up off a crime scene under exigency exceptions. We’re talking about the DNA coming down off a person.) They said it was just fingerprints. It’s not. And now – at least for now – this law will stand. As you can see above, despite hundreds of hours, compelling arguments, and no less than four amicus cert petitions, the Supreme Court has decided it will not hear the case. At this point, Warnken, LLC represents many, many more law enforcement officers than it does those charged with or convicted of a crime. But the Raynor case has to do with what’s right. We respect the hell out of law enforcement, but we also respect the hell out of the Fourth Amendment and the United States Constitution. The Constitution and it’s Fourth Amendment get whittled down all the time. It is, to some degree, the nature of a government. A government wants to make itself larger. A government wants more control, more order, and greater flexibility to do what it deems right. On it’s face, this isn’t a terrible thing. But what about when what it deems right isn’t what you deem right? What about when what it deems right isn’t what the collective you deem right? What about when your kid gets arrested because DNA put him somewhere with his friend when the friend was doing something he shouldn’t have been? And that conviction lives with him forever. What about when you become a quadriplegic in a car accident, hit by a drunk driver, and you and your family only get $815,000? I mean, you’re a lawyer, you can still work, so there’s no lost wages. And your health insurance company has a lien out for all the medical bills. Is it OK that government encroaches then? Something happens when government encroaches too much. Revolution. Okay, so societal order will not break down because of some little denial by the Supreme Court. All I’m saying is we invented this country for a reason. Most of us seem to forget what that reason was. Update: If you don’t think discarded DNA is any big deal, check out what this person is doing with it. And look at the steps they take to make sure the president doesn’t leave a bit of genetic material behind – http://www.theatlantic.com/magazine/archive/2012/11/hacking-the-presidents-dna/309147/.